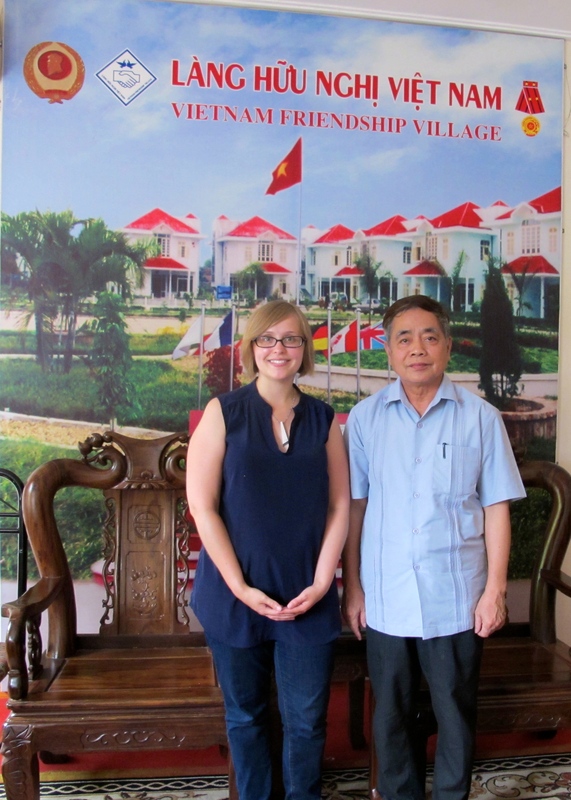 Director Dang Vu Dung and I pose in Friendship Village’s reception room. When I was in Hanoi this summer, I visited Friendship Village, a community founded by an American veteran in the early years after the war as a symbol of peace and reconciliation. 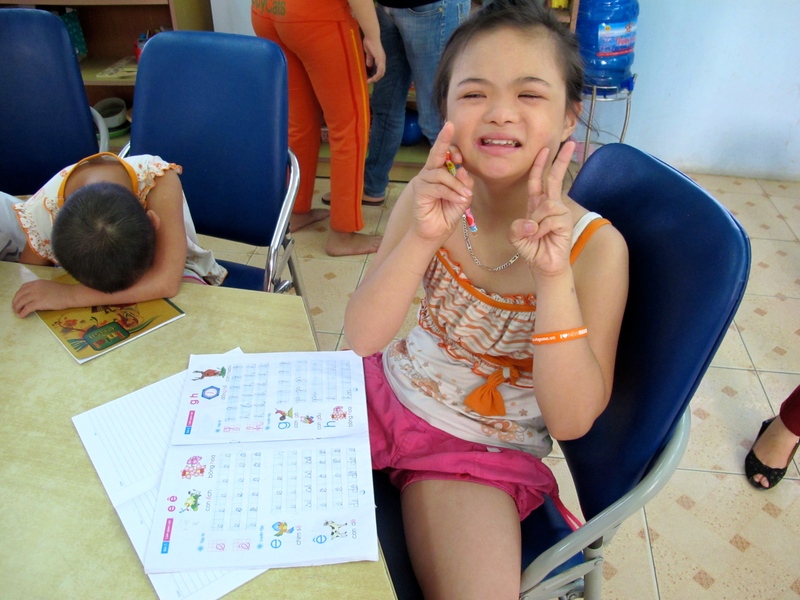 Thanks to the continuing support of American veterans and their families, the village has since grown into a large residential school and medical center that serves 70 Vietnamese veterans and 120 children affected by Agent Orange. The village is run by Director Dang Vu Dung, a North Vietnamese Army veteran of the US-Vietnam War. He served in Quang Tri Province starting in 1972 and was tasked with ensuring that the North Vietnamese troops had enough food. After retiring from the military, Dung came to Friendship Village and met American veterans for the first time. When I asked Dung if he had any negative feelings toward the American people after the war, he said no. One of those Americans protesting the war was George Mizo, the American veteran who first conceived of Friendship Village in 1988. George volunteered for the Army at age 17 and became the youngest sergeant in the US military by the time he was 19. He eventually made his way to Vietnam, where he was wounded three times. George became disillusioned with the military’s mission in Vietnam and the Army’s treatment of Vietnamese civilians. After recovering from his battle injuries, George refused to return to Vietnam and was court-martialed. He spent the next two years in a military prison. 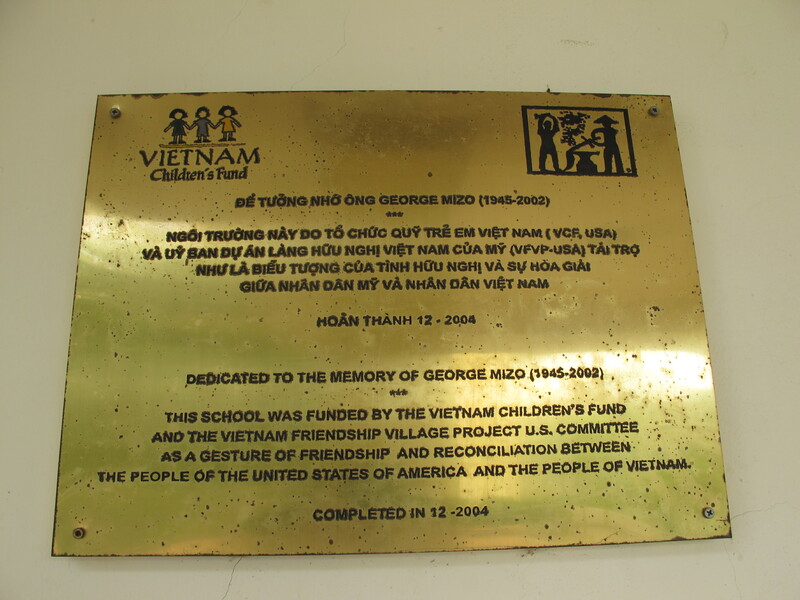 After extensive discussions with Vietnamese veterans along with peace activists from France, Germany, Japan and the United States, George’s “living symbol” — Friendship Village — finally opened in 1998. 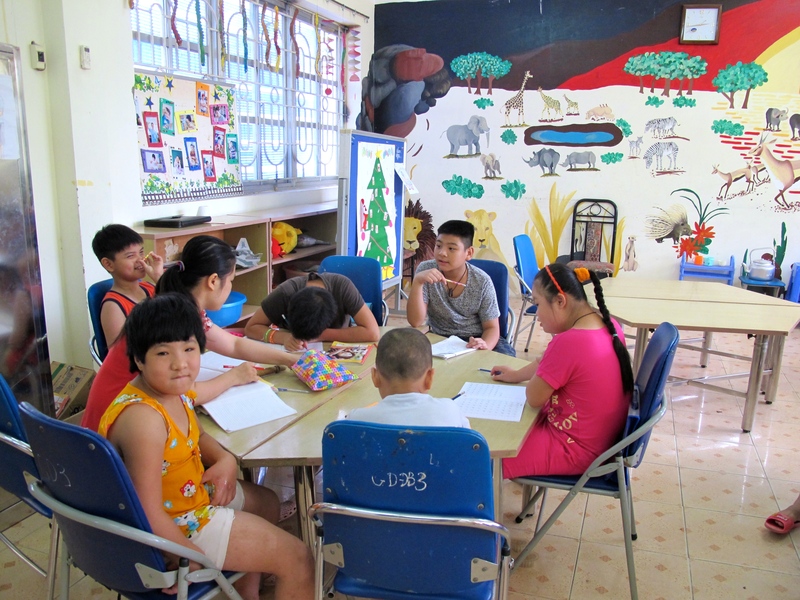 Students practice their writing and arithmetic in a Friendship Village classroom. American volunteers have painted murals in the classrooms and dorms. (Photo by Nissa Rhee, June 2014). Sixteen years on, the students and veterans at Friendship Village are thriving. Three students have gone on to college after graduating from the school. Despite the challenges the students face in getting admitted, one student I met told me that he hopes to go to university and become a writer someday. Others will use their new skills to find jobs as hair stylists and artisans in their communities back home. 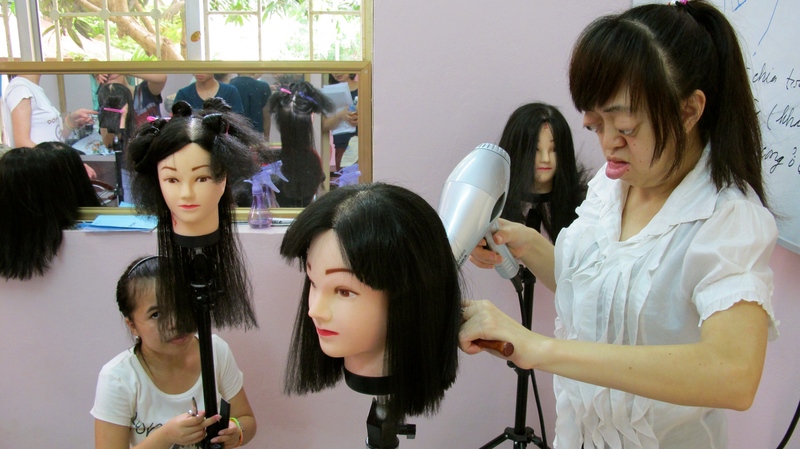 In Friendship Village’s newest venture, students learn how to wash and style hair. The hope is that such training will allow the students to find jobs in beauty salons. (Photo by Nissa Rhee, June 2014). While George passed away in 2002 from an illness linked to his wartime exposure to Agent Orange, American veterans and their families continue to be involved in the village today. Veterans like Don Blackburn are members of the village’s international board and spend time raising money for the Vietnamese students and veterans who rely on the village for support. 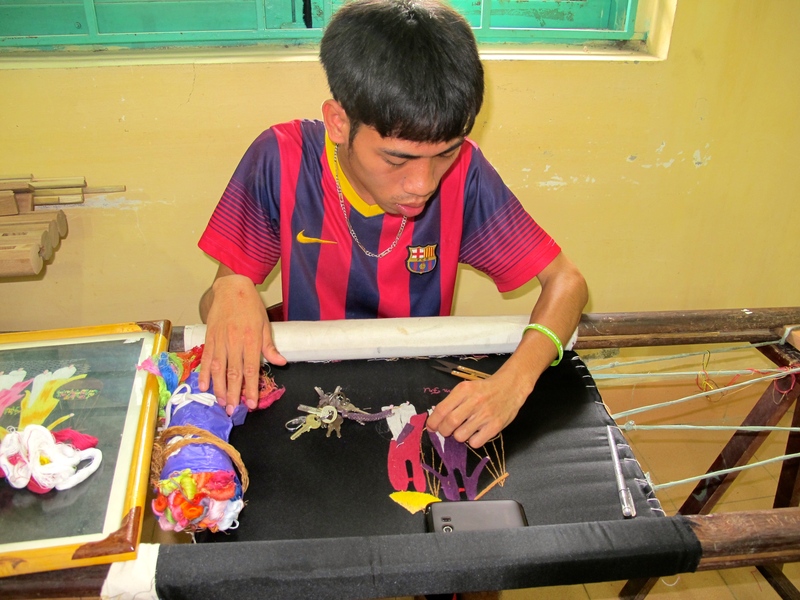 Additionally, the village hosts a large roster of international volunteers and interns who do everything from paint murals in the classrooms to teach the students math and photography. The poem — entitled “For Friendship Village” — can be found in his book “All You Have Given: Meditations on War, Peace & Reconciliation.” A portion of the proceeds from the book benefits Friendship Village.